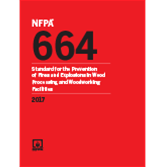 The 2017 edition of NFPA 664 aligns with NFPA 652, to help you provide appropriate dust control measures and improve safety in wood processing and woodworking facilities. Help protect lives, property, and commodities from the risks of dust-related fires and explosions. Fire and life safety in woodworking facilities demand special dust hazard mitigation using the 2017 edition of NFPA 664: Standard for the Prevention of Fires and Explosions in Wood Processing and Woodworking Facilities. This Standard presents the latest requirements for the construction, operation, and protection of industrial, commercial, or institutional facilities that process wood or manufacture wood products. NFPA 664 is a "must" for industrial and commercial facilities. This Standard is essential in facilities that house woodworking shops as well as in wood processing facilities that manufacture wood products, and in facilities that process wood, creating wood chips, particles, or dust that occupy areas greater than 5,000 sq. ft. (465 sq. m), or those that have an aggregate dust collection flow rate greater than 1500 cu. ft. per minute (2549 cu m/hr). Changes in the 2017 edition align with the recently issued NFPA 652: Standard on the Fundamentals of Combustible Dust. Definitions correlate with those in NFPA 652. Added objectives in Chapter 4: General Requirements are aligned with those of other industry and commodity-specific combustible dust standards, including NFPA 652. A clarified scope indicates that NFPA 664 addresses carpentry shops that exceed certain size thresholds, in addition to other types of woodworking and wood processing facilities. Interested in other editions of NFPA 664? Use the drop down menu above to select the edition year you need. 4.7 Designer and Installer Qualifications. 6.3 Occupant Life Safety Systems Means of Egress. 6.4 Separation of Hazard Areas from Other Hazard Areas and from Other Occupancies. 7.9 Machines and Processing Equipment. 7.10 Machinery Setup and Maintenance. 7.14 Spontaneous Ignition and Chemical Action. 7.17 Portable Electric Equipment and Appliances. 8.2 Particulate Conveying and Dust Collection Systems. 8.3 Thermal Oil Heating Systems. 8.4 Particulate Size Reduction Equipment. 8.5 Panel Product Manufacturing Machinery. 8.12 Wood Scrap or Wood Waste Processing and Disposal. 10.11 Impairments of Fire Protection and Explosion Prevention Systems. 10.14 Emergency Planning and Response.